Fernandinho is down and having treatment after a clash with Connor Wickham. A stretcher is coming on, but I don't think he needs it. Palace launch the ball forward. Time for one last attack? Yaya Toure needs treatment as the clock continues to tick down. Yaya Toure is constantly moving as the ball comes in, the defenders freeze and watch the ball and Yaya nips in. All the players are pleased to have him back. You can see that. City replace Sergio Aguero with Fernando as Pep Guardiola looks to see this one out. The travelling fans sing Yaya Toure's name as Aguero trudges off. Palace are roughly six minutes away from a fifth straight defeat. They throw on Bakary Sako for Martin Kelly to try to rescue something. There is a mini-pitch invasion, including a man and his baby daughter, as City fans celebrate. Kevin de Bruyne drilled a low corner across the box and Yaya Toure was in the right place to turn it home. A change for Palace. Lee Chung-yong replace Christian Benteke. Connor Wickham goes in the book after a challenge on Kevin de Bruyne. City also have a free-kick in a dangerous position near the right-hand corner of the box. Palace clear their lines but City keep the pressure up until Kevin de Bruyne slices high and wide. City have had a few sniffs since that Palace equaliser but the ball has not dropped for them in the box. So far it has deflected wide off Raheem Sterling and, just now, flown straight at Wayne Hennessey after Aleksandar Kolarov got a touch. It's impossible to call this game at the moment. City want the win so they are not going to sit back. Palace look extremely dangerous on the break, so they will be happy with that. A change for City as Pep Guardiola reacts to Palace's equaliser. David Silva is on for Nolito. I've just seen that Aguero chance again by the way. Wayne Hennessey got something on it but the ball might still have spun over the line if Joel Ward had not slid in to clear. City almost go 2-0 up when Sergio Aguero is denied after meeting Kevin de Bruyne's wicked cross. Seconds later, Palace go up the other end and equalise. Wilfried Zaha feeds Connor Wickham, who goes past Pablo Zabaleta too easily and blasts home past Claudio Bravo. 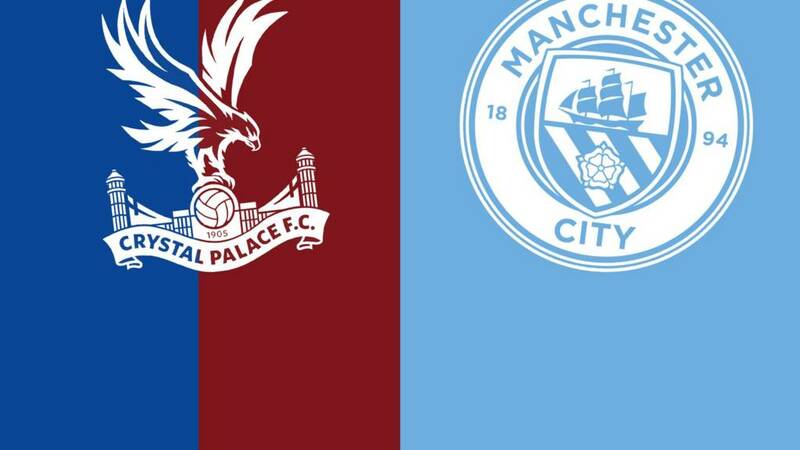 Palace are throwing everything at this, and everything is being aimed at Christian Benteke but, between them, City's defence and their goalkeeper Claudio Bravo are coping. Another City attack sees Raheem Sterling tee up Kevin de Bruyne but his first-time shot from the edge of the area soars high over the bar. We've just had our first yellow card of the game - Nicolas Otamendi was booked for dissent and now his City team-mate Nolito has joined him for a foul on Wilfried Zaha. Respite for City as they earn a corner. It drops for Sergio Aguero who does well to create space for a shot but then skews it horribly wide. This makeshift City defence is being tested at the moment. Palace's stream of corners and free-kicks continues.